"Murmurs of life filtered through their faded, whitewashed walls, sounds of laughter and tears, talking voices and wordless moans. The city was a living creature, hungry, and untamed beneath its thin veneer of civilization." Caim makes his living on the edge of a blade, but when a routine job goes south, he is thrust into the middle of an insidious plot. Pitted against crooked lawmen, rival killers, and sorcery from the Other Side, his only allies are Josephine, the socialite daughter of his last victim, and Kit, a guardian spirit no one else can see. This is one of the books I bought while browsing the book fair in Ghent last year. I had no idea what it was about and I’d never heard of the author before. The reason I picked it up was because of its gorgeous cover. It’s actually the work of Michael Komarck, one of the very talented Cover Artists I’ve made a blogpost about. Once I got home, I was in for a little surprise. I had purchased my very first signed book! Yay for me! I started reading this book a while ago and took a few pauses in-between. If I have to be honest, it’s not easy to get back into the story after taking a break of a few weeks. It takes a while to become a part of our main character’s life because there’s just so much information that needs to get in to your head before you can fully enjoy the story . If you want to read this book, read it without any disturbances. Because once you’re fully immersed in the story, this is a captivating read. 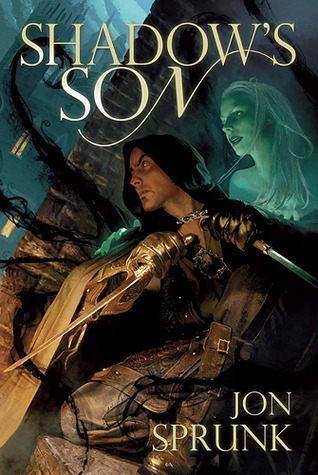 Shadow’s Son is an interesting novel about an assassin, Caim, struggling with his inner demons, the corrupt City Council/Church and an evil plan to get him out of the way. There’s also a tinge of romance throughout the book, but it’s not overwhelming, which is one of the main things I love about this book. I really like how the author started out with a bunch of different, separate characters whose storylines intertwine during the story and come together perfectly. And best of all, I LOVED the ending. It’s been a while since I’ve read a perfect ending to a book that’s part of a series, but Jon Sprunk nailed it. The characterbuilding in this fascinating book was wonderful. I’ve come to love all the main characters involved in this magnificent story. The worldbuilding on the other hand could have been better. It’s not that it wasn’t done well, it’s that I would have wanted more of it. I love to get to know different worlds and their cities and I just didn’t get enough of that in this book. Maybe we’ll get to see a bit more of, what sounds like, a beautifully crafted world in the next 2 books, but for now it just wasn’t enough. All in all, this was a great read, once I was past the first few pages I couldn’t stop reading. I loved every twist and turn of the story and every imaginative description of yet another nerve-racking fight. I'm going to read and review this book (which I bought at the Book Fair in Hasselt) next week and after reading your review I'm looking forward to it. Great review. I've read the book and I agree with you on every aspect of your review. The only thing I don't agree with is the worldbuilding. I had a feeling throughout my reading that there was a whole world to discover and I think that Jon Sprunk will develop that world further in book 2. But the one thing I most agree on is your opinion on the ending. That was one great ending of the book. Actually, I had the same feeling! But that was just it, it was just a feeling, like a whole beautiful world waiting to be discovered, but it didn't happen quite yet. I hope we'll get to see more of it in the following books.